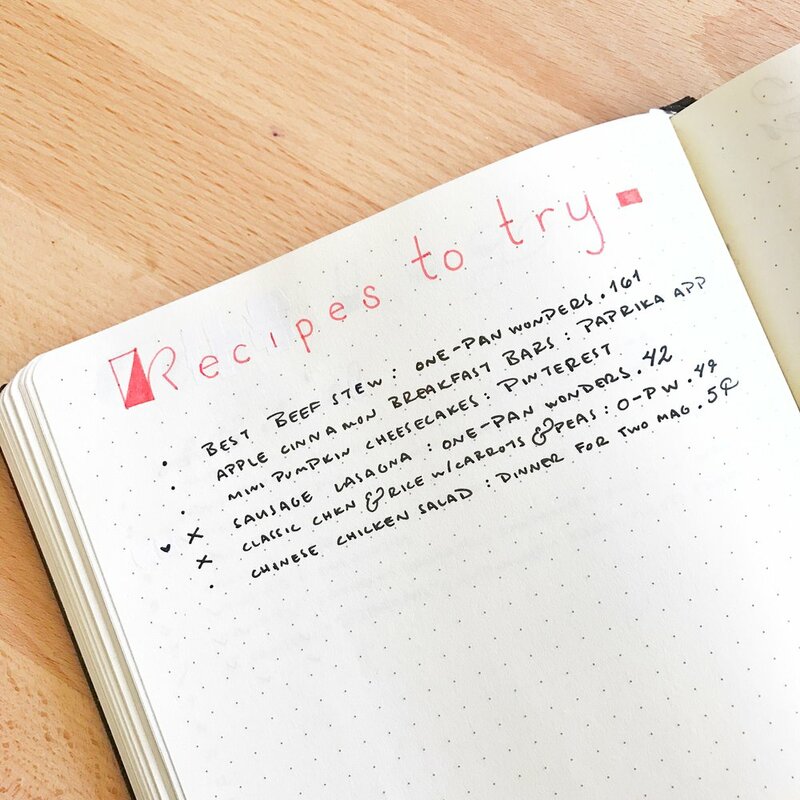 Recipes To Try: Spice up your food life with your Bullet Journal. Welcome to Day 5 of my #100DaysofBulletJournalIdeas Project! Do you have yummy recipes you've found in cookbooks, magazines, pins on Pinterest, or in some other form that you'd like to make someday, with good intentions, but then never look at again? It's like you bookmarked it somewhere, but that bookmark is no where to be found when you need it? Well, one of the great things about the Bullet Journal is that you can create a Collection for just about anything! If you love food - who doesn't - I recommend creating a Recipes To Try collection to stash the recipes you want to try out. This is an proactive method to help you engage with the recipes you're already excited about by taking the time to write them down on paper. This will lead you to be more likely to finally try that tasty dish! Writing things down has always helped me remember them better. It's a simple list that will act as an Index of where the recipes are located, this way you are able to note down the recipe's name and where you can go back to find it later when you're ready to cook! This little trick is something I call the Notebook Threading technique. It's a handy little device that 'points' to where information is located. I explain it further in this article. After you try it, you can mark it as completed and then if you like it you could add a little heart to signifier to indicate that you liked it. You could also migrate it over to your Master List of Meals Collection to add it to your growing Go-To Meals. As mentioned in my Master List of Meals idea, you could also create a few simple columns in any manner you choose, such as BLDS for Breakfast, Lunch, Dinner, Snack as noted here, or for proteins or cooking preferences. Besides the columns, this idea still acts like a simple master Index for the recipes, where you write down where the recipes are located afterwards. For example you can see how after Best Beef Stew I wrote "One-Page Wonders.161" this is the notebook threading technique I use to know where I need to look to find further information. It doesn't have to be a notebook, it works just as marvelously for cookbooks and more. If you like the recipe, check off that you cooked it and add some sort of signifier to the left of it to note it after the fact like the heart I used here. The recipe's name and source where it can be located. There is also a bit of room if you're like to write down further information such as how long it takes to cook, servings or otherwise. To write down the main ingredient. We cook by the main ingredient, so if we're feeling chicken or beef, this is a handy way to glance at the main ingredient for the recipe. Here's where to write the rest of the ingredients and the quantity you need for each. I love this layout for this idea because it's a simple and easy way to engage a bit more with the recipe and writing it down makes me aware of the ingredients. It also helps encode the recipe into my memory a bit because I took the time to write it down, which always helps me remember things. You could just underline the main ingredient, bold it, write in a different color or in cursive to visually set it apart, I just thought the column was a fun touch. Another idea is that you could have a different one of these collections per type of main ingredient, but that might get to be too much. Start simply and over time adjust as needed. I like the continuous flow of adding an idea after another while maintaining an organized, yet flexible, structure. That's a huge part of the Bullet Journal ethos and one of the reasons I love greatly about it. It's a Handy tip for Meal Planning purposes. I can flip to this collection to browse the different recipes I want to try and when it comes time to write down the ingredients on my grocery list, I can just copy down the ingredients without having to look up all of the different recipes. This is also a nifty idea if you're an 'on-the-fly' kind of meal planner, where you tend to browse the grocery store for whatever seems yummy, you could flip to this collection and grab the ingredients to those yummy recipes! I suppose this is always possible thanks to the power of the internet...there's just something about analog with its distraction-free power that helps focus your mind. 1. I love finding recipes via Pinterest, All Recipes, and good ol' Google. 2. For as long as I can remember, I've loved using the Paprika app to store the recipes I find online. 3. I also love using Paprika while I'm cooking because I can 'check off' ingredients while I'm cooking, which makes it easier to see which ingredients need to be added or not to the recipe. I love Paprika. 4. I highly believe analog and digital work beautifully together. 5. Adding this collection works perfectly to my meal planning efforts. 6. For any of these ideas you could also a star rating or some other form of rating to help you see how much you liked the recipe. I just like adding a simple heart, because for me there's only that I liked or didn't like a recipe. I'm probably not going to make a recipe again if I only rated it 3/5 stars, you know? Life's too short for food you're not jazzed about. In case you were wondering...I recently bought this cookbook while moseying through Target because I loved the idea. I mean, one pan cooking?! I'm there! The less clean-up, the better! I've tried a couple recipes so far and they were tasty. I'm excited to try some more out, thanks to my handy dandy new Recipes To Try collection! Amazon affiliate links below, which means that if you make a purchase through them, I will make a commission at no extra cost to you. Thank you for your support! P.S. If you're new to the Bullet Journal®, I recommend checking out BulletJournal.com, it was invented by Ryder Carroll - he's an awesome human that walks you through how to set up your own Bullet Journal with his handy tutorial video that you can check out here! Wondering what items I used? Here ya go! These are Amazon Affiliate links, which means that if you make a purchase through them, I will make a small commission at NO extra cost to you, thank you for your support! The Master Grocery List: Never forget what you need to buy with the help of your Bullet Journal!